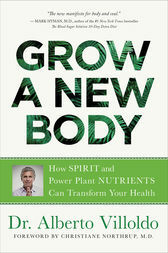 This newly revised edition of the Wall Street Journal bestseller One Spirit Medicine offers an accessible guide to an ancient practice for healing and transformation--including new, cutting-edge science, recipes, and a 7-day Grow a New Body meal plan! Using the principles and practices in this book, you can feel better in a few days, begin to clear your mind and heal your brain in a week, and in six weeks be on your way to growing a new body--one that heals rapidly, retains its youthful vitality, and keeps you connected to Spirit, to the earth, and to a renewed sense of purpose in your life. Our minds, our emotions, our relationships, and our bodies are out of kilter. We know it, but we tend to ignore it until something brings us up short--a worrying diagnosis, a broken relationship, or simply an inability to function harmoniously in everyday life. When things are a little off, we read a self-help book. When they're really bad, we bring in oncologists to address cancer, neurologists to repair the brain, psychologists to help us understand our family of origin. This fragmented approach to health is merely a stopgap. To truly heal, we need to return to the original recipe for wellness discovered by shamans millennia ago. Drawing on more than 25 years of experience as a medical anthropologist--as well as his own journey back from the edge of death--acclaimed shamanic teacher Alberto Villoldo shows you how to detoxify the brain and gut with superfoods; use techniques for working with our luminous energy fields to heal your body; and follow the ancient path of the medicine wheel to shed disempowering stories from the past and pave the way for rebirth. Alberto Villoldo has trained as a psychologist and medical anthropologist, and has studied the healing practices of the Amazon and the Andean shamans. Dr. Villoldo directs The Four Winds Society, where he trains individuals in the U.S. and Europe in the practice of shamanic energy medicine. He is the founder of the Light Body School, which has campuses in New York, California, Miami, and Germany. Dr. Villoldo has written numerous best-selling books, including Shaman, Healer, Sage; Power Up Your Brain; and One Spirit Medicine.